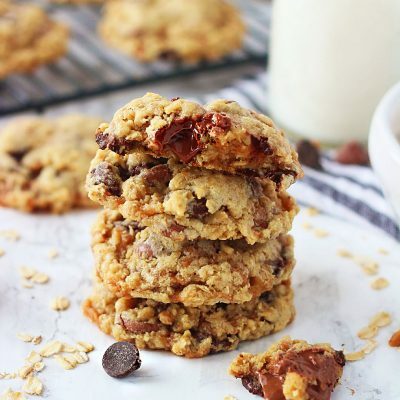 These Oatmeal Toffee Chocolate Chip Cookies are loaded with chocolate chips, toffee bits and oatmeal. Does it get any better? They’re soft, chewy with just a slight crisp on the edges, they’re crazy delicious! Hi! 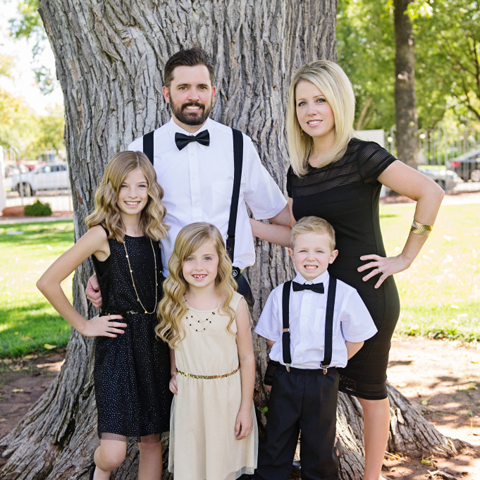 I’m Jodi and I blog over at 5 Boys Baker. I’m so excited for this chance to be a contributor here on Holly’s blog. 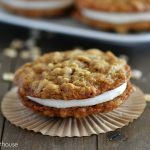 I’ve loved and followed her blog for years and absolutely love her recipes! In case you couldn’t tell from the name of my blog I have 5 sons. I am completely outnumbered at my house, even our dog is a boy. Life with boys has definitely been an adventure and I wouldn’t trade a second of it. 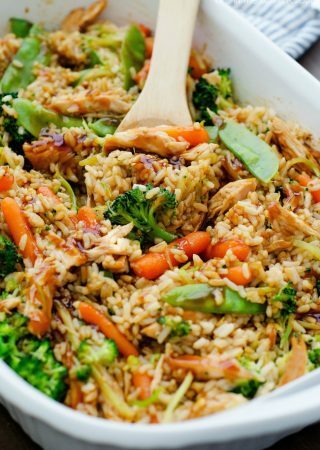 My boys are my greatest taste testers and every recipe I post has to be given the “BW” thumbs up from them. If you’re wondering what “BW” is, it means blog worthy. That’s been our thing around here since I started my blog. My boys taste everything I make and will say “definitely BW mom” or definitely not BW. I have loved to bake for as long as I remember. My sweet grandma and mom taught me everything I know and it’s because I them that I love to bake. Cookies are definitely one of my favorite things to make. I think I have more cookie recipes on my site than anything else. There is nothing better than a warm, gooey chocolate chip cookie, or any kind of cookie. But I’m not going to lie, it’s all about the dough too. What is it about cookie dough that makes it impossible to not eat? 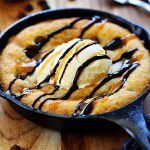 Are you a cookie dough lover like me? 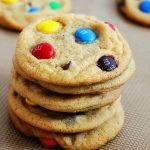 That being said, I figured my first guest post here on Life in the Lofthouse obviously needed to be a cookie recipe. 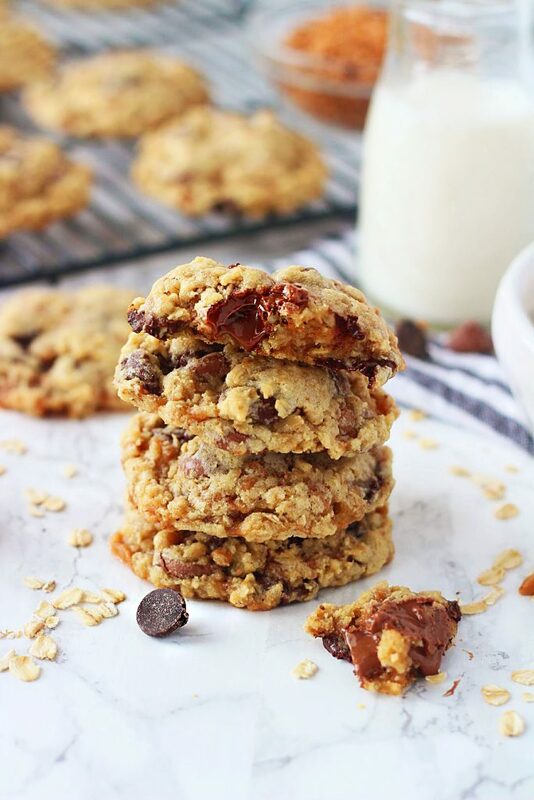 These Oatmeal Toffee Chocolate Chip Cookies have quickly become a favorite at our house. 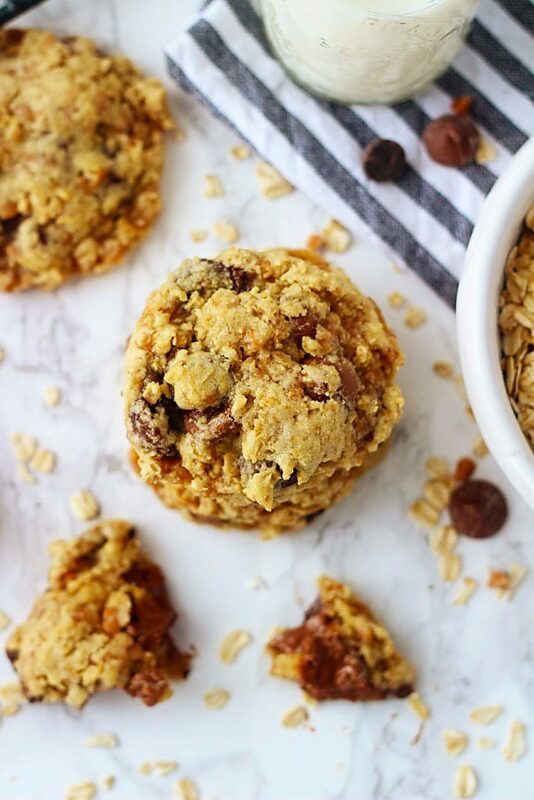 They’re loaded with chocolate chips, toffee bits and oatmeal. . . does it get any better? 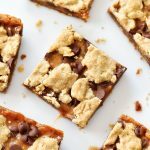 They’re soft, chewy with just a slight crisp on the edges, they’re crazy delicious! Like I mentioned before, cookie dough is totally my thing and this cookie dough is insanely good. 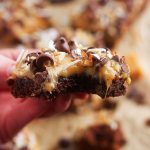 When I make these I probably eat more dough than I do cookies. Ok, who am I kidding, I do that with almost any cookie dough (lol!). Skor bits are my absolute favorite, but sadly they stopped selling them in the United States years ago (that was a sad, sad day). You can find them online (a little pricey, but kinda worth it) or if you’re ever in Canada you can buy them there. I’ve had two friends go to Canada this past year and have been kind enough to grab me some (best friends ever!!). Combine butter and sugar and beat until light and fluffy (2-3 minutes). Add baking soda, salt and flour and mix until just combined. Add oatmeal and continue mixing until well combined. Stir in chocolate chips and toffee bits. Using a large cookie scoop, drop onto lined cookie sheet. Bake at 350 for 9 to 10 minutes (cookies may still look slightly underbaked) . Remove from oven and let set on cookie sheets for about 3-4 minutes. Do not over bake! WOW- these look amazing!! I can go for one right now! The instructions say “sugars” but the ingredient list only indicates brown sugar. I’m assuming the “s” in the instructions is a typo, but just checking I’m not missing some granulated sugar in the recipe.